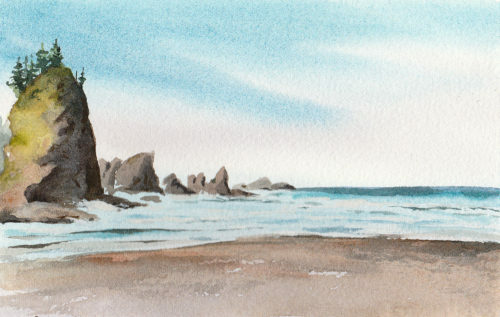 This is part 2 of my 30×30 Direct Watercolor challenge recap, read part 1 here! 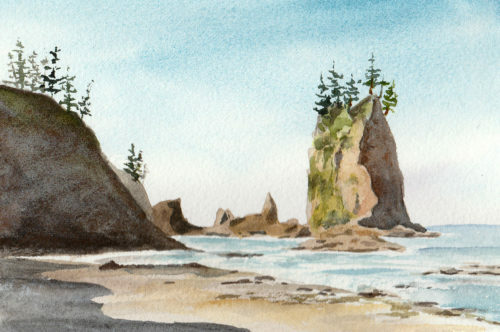 The last week of my 30×30 Direct Watercolor Challenge sketches were inspired by a family adventure to Second Beach, just south of La Push on the Washington Coast, where we welcomed in the summer. 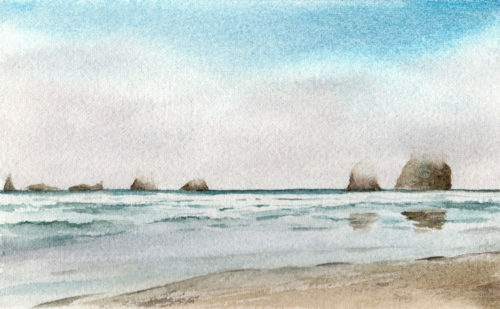 Sea stacks rose into foggy low light as I sat down to sketch. 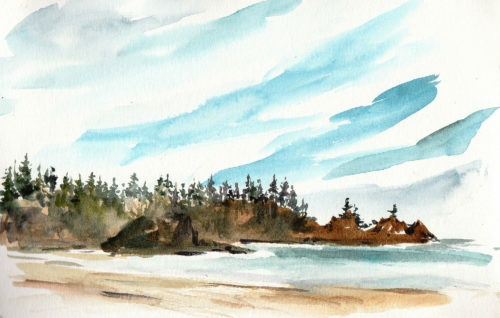 As an experiment, I completed both an ink and watercolor as well as a direct watercolor sketch of the same view. It was refreshing to hold a pen, I’ve missed it! I love working with ink, but here it was interesting to compare the mood of the sketches. While the pen was expressive, the watercolor was more evocative of the moment. 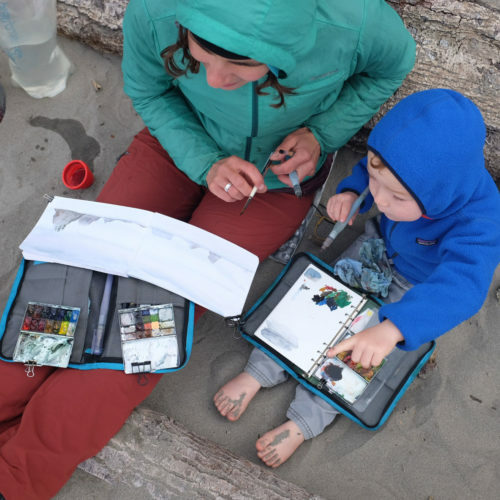 My young friend Finn joined me, borrowing my daughter’s Art Toolkit. Sharing art is one of my delights as an artist. 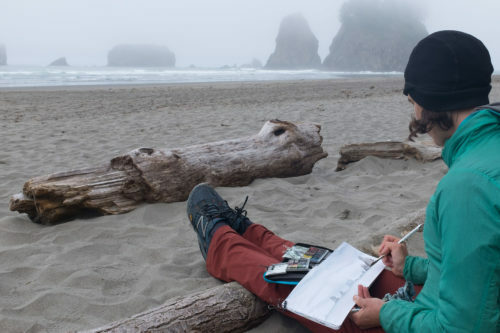 An open sketchbook invites observation and connection. 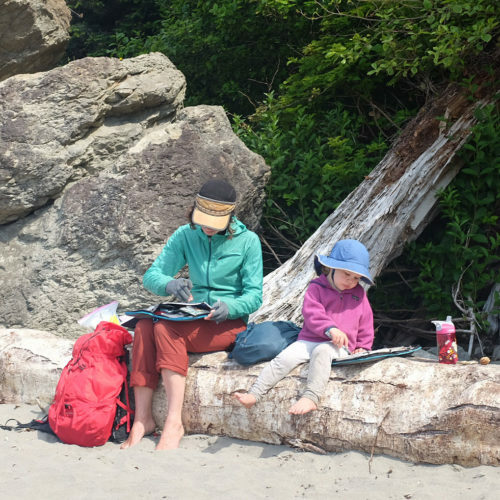 I continued to sketch as we explored the beach. Each time I sat down, a young person usually joined me. 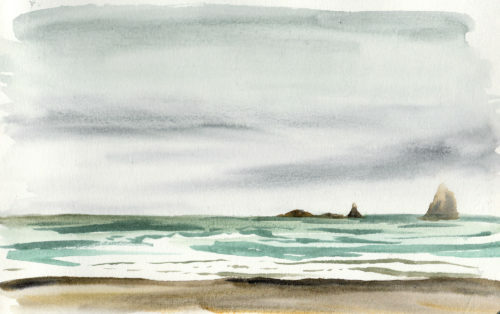 At the southern end of the beach, I dove in again with pen, enjoying expressive marks. 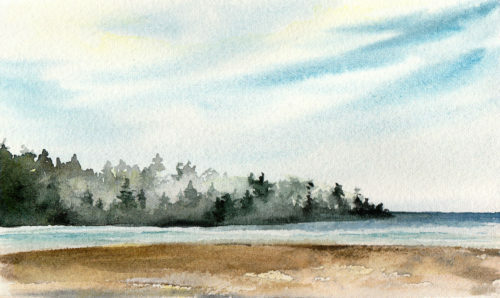 I intended to do a direct watercolor version of this one as well, but soon it was time to hike back to our tents. I decided I could revisit the subject in my studio. Once home, I created a small series of studies. I missed pencil, but worked small, in a 4″ x 6″ format. As I painted, I warmed up to the forms, light, and palette. Open atmospheric landscapes have always resonated with me. The shadows in this final piece were my favorite elements. In the studio, I am accustomed to a degree of control and deliberateness where I paint with clean washes, specific shapes, and limited palettes. It’s a different process from my rapid, reactive field sketches. My field work very much informs my studio work, but so far the direct watercolor practice for me feels most suited to the field. Outside I can let go and let paint fly across my page, in the moment and in the elements. 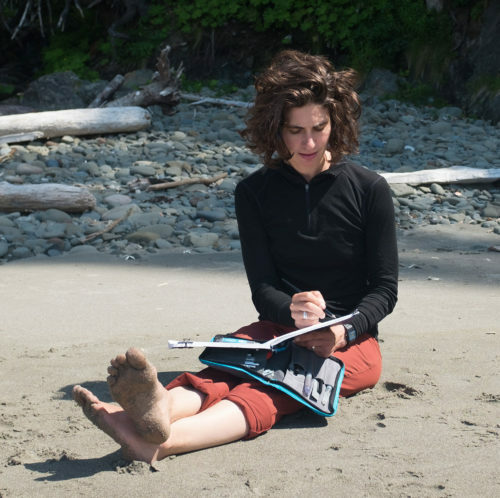 These observations and experiences, what I call my “palette of place,” then inspire and inform everything else I do. Thank you for joining my journey and experiments and stay tuned for my future projects! Thank you! It’s such fun to share art with the little ones.